This tree produces a large blackish fruit with light red flesh and one large single seed. The seed has a distinctive 'cut' diamond shape across side. 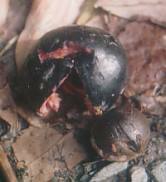 It is found in the rainforest of eastern Queensland (Cooper and Cooper 1994).